Centre for Science and Environment (CSE) invites journalists working in India to attend its one-day briefing workshop -- Food Talk -- on the subject of food product labelling, claims and advertisements. With changing urban lifestyles, our society is increasingly becoming dependent on food prepared in factories. This transition in food habits is being promoted and encouraged through advertisements, and through labels and claims on food packages. A serious concern is the rampant promotion of junk foods, which are high in salt, sugar and fat and are linked with obesity and non-communicable diseases (NCDs) such as diabetes, hypertension and heart disease. In fact, a number of celebrities are involved in promoting these foods. How truthful or ethical are these claims? Should celebrity endorsement of such products be permitted? What is the state of our laws and regulations on this issue? This CSE workshop for journalists aims to bring together advertising professionals, health experts, consumer rights workers, celebrities and their brand managers, regulators and lawmakers and the media on a single platform to discuss and debate this crucial issue and answer these questions. The workshop will end with a Public Forum which is expected to be attended by the Union minister of food and public distribution. CSE will support the travel and stay in Delhi of a few outstation journalists. Support requests will be entertained on a first come first served basis, and CSE’s decision on selection of participants would be final. 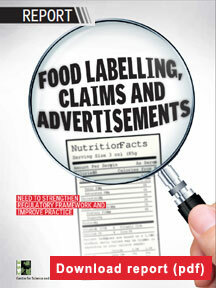 Practices of food labeling and claims: is consumer interest a priority?